Darwin's Big Bus is the ideal way to explore the diverse culture in this laid-back city. From the backpacker hotspot, Mitchell Street, full of open-air cafes and pubs to museums, markets and harbour cruises, Darwin is more than a just gateway to outback adventures - it is a destination itself. Big Bus Darwin operates hop on hop off bus tours. The tours are informative with a pre-recorded commentary. There are two routes - the Morning Tour (Red Route) and the Afternoon Tour (Blue Route). Apart from the time, the only difference with the Blue Route is that it includes the Military Museum. The tours on the Red Route run every 60 minutes between 9.00am - 11.00am and the tours on the Blue Route run every 90 minutes between 12.00pm and 3.00pm. With so much to see and do in Darwin, here's how to make the most of your day. 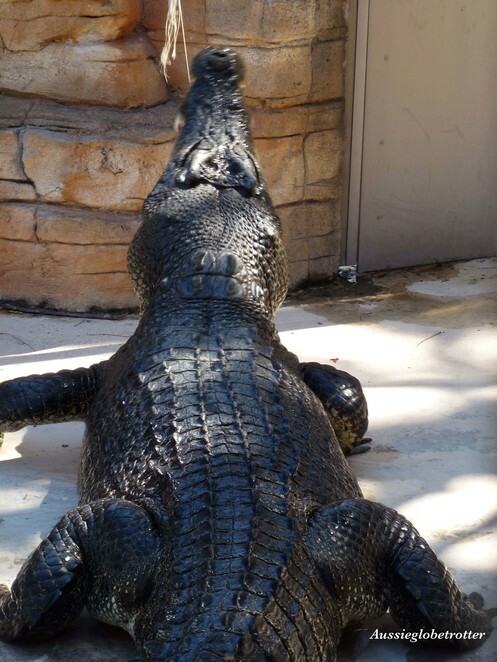 Situated in the heart of Mitchell Street, Crocosaurus Cove is the place to swim, touch, feed and learn all about these incredible reptiles. Guests are provided with the opportunity to hold a baby crocodile and feed the juvenile crocodiles with a fishing rod. Both of these activities are included in the admission price. If you're feeling adventurous, jump in the Cage of Death to get up close and personal with some of the largest crocs in captivity. 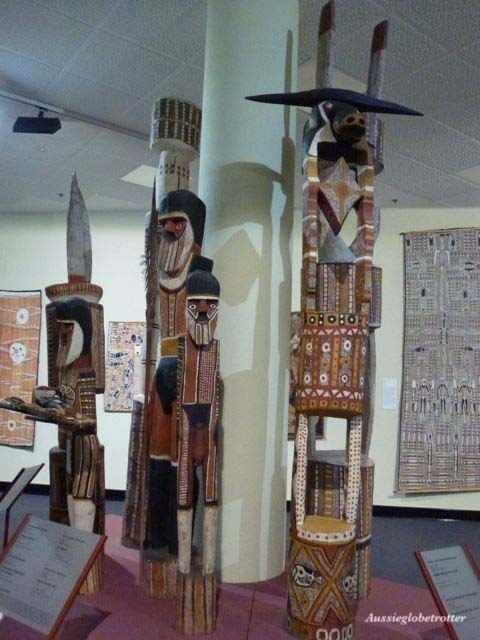 History comes alive at the Museum and Art Gallery of the Northern Territory. The museum houses renowned artistic, cultural and scientific collections. A whole exhibit has been devoted to Cyclone Tracy that struck Darwin on Christmas Eve 1974. This brilliant exhibit is separated into two parts, depicting life in Darwin before and after with visitors passing through a Black Room. In the Black Room, you are transported to that fateful day, with an actual sound recording of the wind, flying corrugated iron and smashing glass. Entry is free. Join the Blue Route to travel to the Military Museum. This is a fascinating museum. The Defence of Darwin Experience includes an interactive display depicting the Japanese bombing of Darwin. Watch the short film that uses actual footage from 75 years ago and listen to first-hand accounts from the people who survived the morning of 19th February 1942. The Australia at War exhibit's artefacts include uniforms, weapons, photographs and interviews tell the stories of our service men and women involved in international conflicts from the Boer War to today. 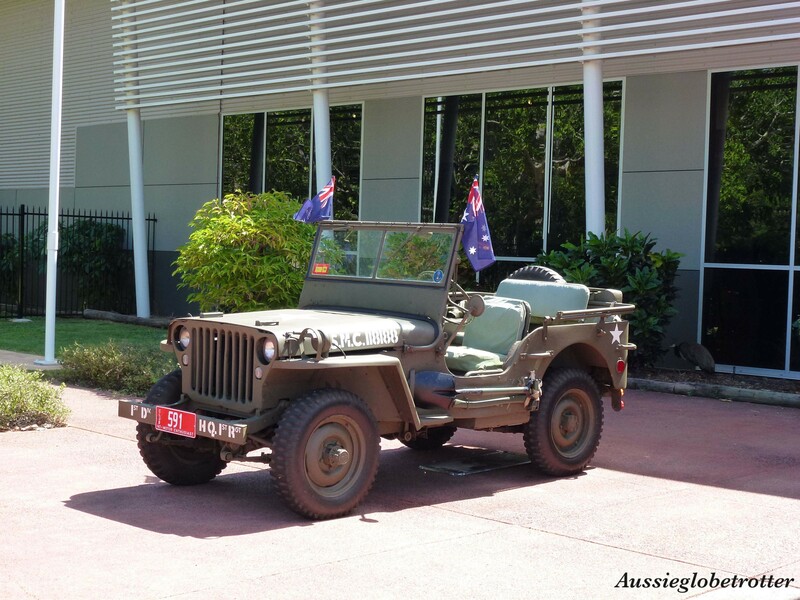 Outside, explore the range of military vehicles and artillery pieces. Darwin's Waterfront Precinct is the ideal location to escape the heat. 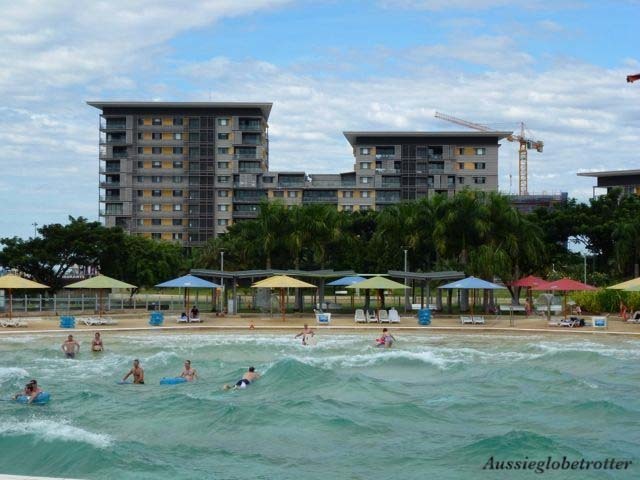 This trendy yet relaxing area is home to a man-made beach and a wave lagoon. Entry to the wave lagoon is $7 and boogie boards and tubes are supplied on a first come, first served basis. 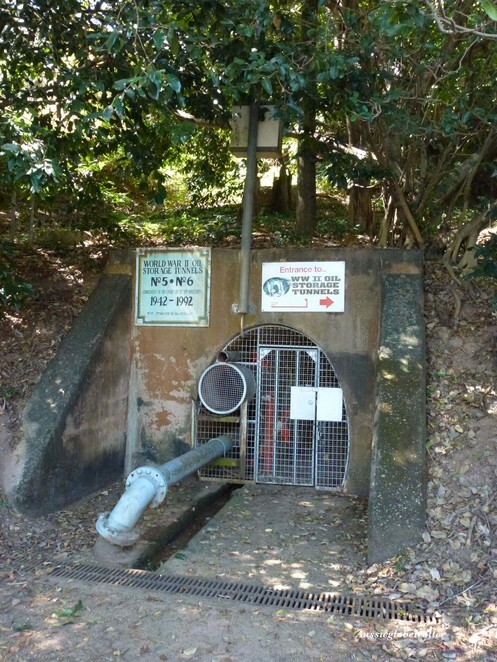 Nestled beside the Darwin Wharf precinct, the World War 2 Oil Storage Tunnels are a unique tourist attraction. When Darwin was bombed in 1942 and 1943 its oil supplies were destroyed. 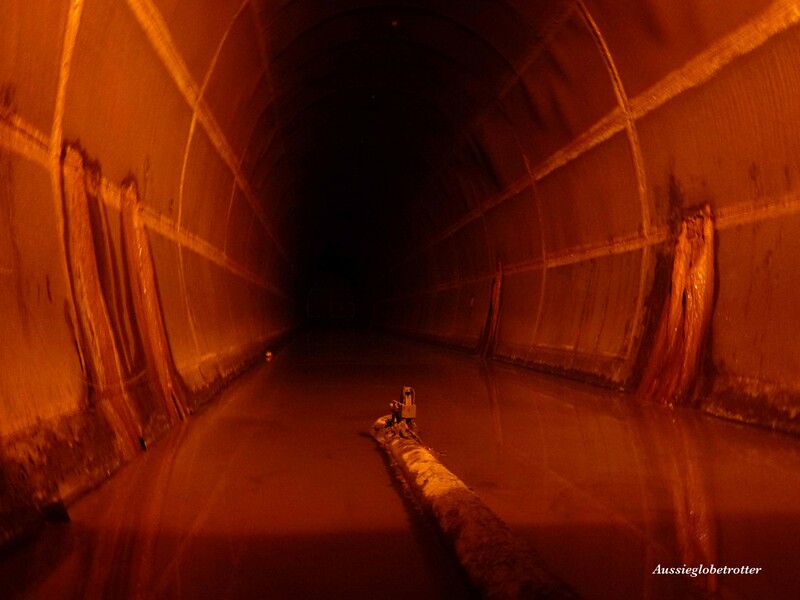 As a result, the Civil Construction Corps began work on eight underground storage tunnels. 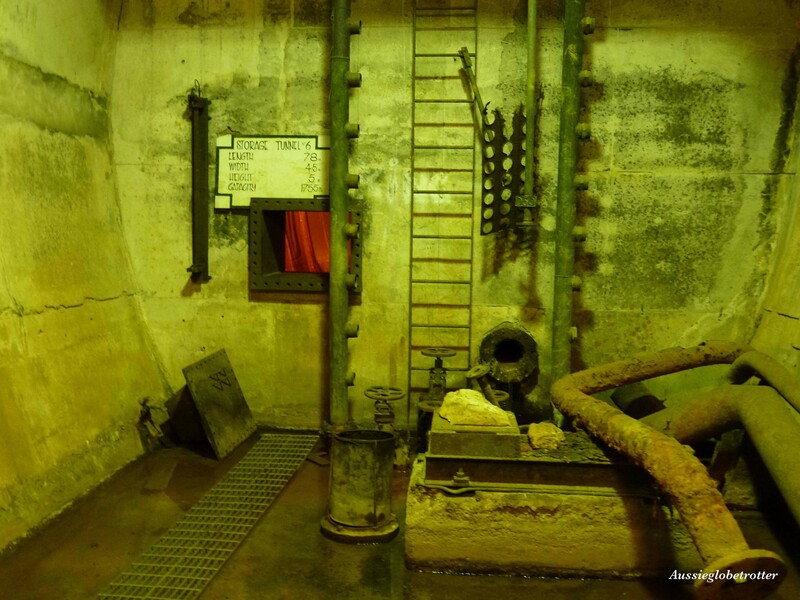 It is believed that as many as 400 men helped build the tunnels. Conditions were difficult and industrial action slowed the construction progress. Only five of the tunnels were completed when the war ended. Allow 30-45 minutes for this self-paced tour. Interpretation boards and photos line the tunnel walls providing fascinating insight into Darwin's rich history. Books are for sale at the entrance and the knowledgeable gate keepers are available to answer any questions. Continue on to stop 6 to awaken your senses to the sights, sounds and tastes from the Mindil Beach Sunset Markets. Aromas fill the air from the 1200 individual menu items. Once you've got your tucker, head down to the beach with a picnic blanket to watch the spectacular colours from the sinking sun. 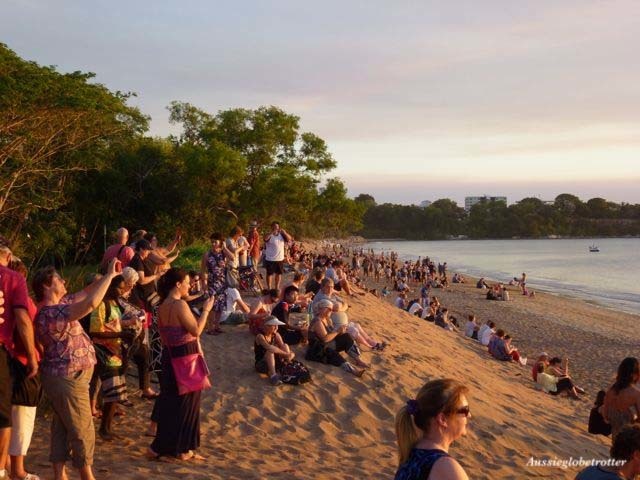 Thousands of locals and tourists flock to this beach every Thursday and Saturday night during the dry season. After sunset, the markets start throbbing with buskers and visitors checking out the arts and craft stalls. There really is something for everyone here – paintings, photography, clothing, didgeridoos, and essential oils.